Ordered for a good friend with a nickel allergy and he loves it! He wears it everyday. Offer something unique, elegant, and refined to your collection with this handsome rosewood dome ring. The sophisticated ring features a strip of real Santos rosewood inlay, set into the top of the titanium band to create a bold and masculine look. The lightweight feel and the comfort fit interior make this ring a great choice for easy, all-day wear. I like the ring so much that I ordered two. Unfortunately after only two weeks wearing the first one, I lost it. It never left my finger, so I have no idea where it could be. I ordered the second ring the same day I discovered it was missing. The ring has a comfort fit as advertised. I usually find rings are uncomfortable, but not this one. It hardly feels like you are wearing it. As you would expect, wood products very in color. My first ring was a light brown as shown online. The replacement is quite darker. I actually liked the lighter shade better, but I am now wearing the replacement everyday. I don't intend on losing it. I have worked with wood and admired wooden products for years. It has turned out to be a great buy. Rugged for everyday wear and even dressy for formal wear. Do not hesitate to purchase this ring. The rosewood is quite attractive. Oliveti Men's Dome Titanium Ring with Real Santos Rosewood Inlay Comfort Fit Ring the sizing is small move up one. Very beautiful ring i can wear it on one of my other finger. Very happy, purchasing was hastle free, item was delivered before estimated delivery date. 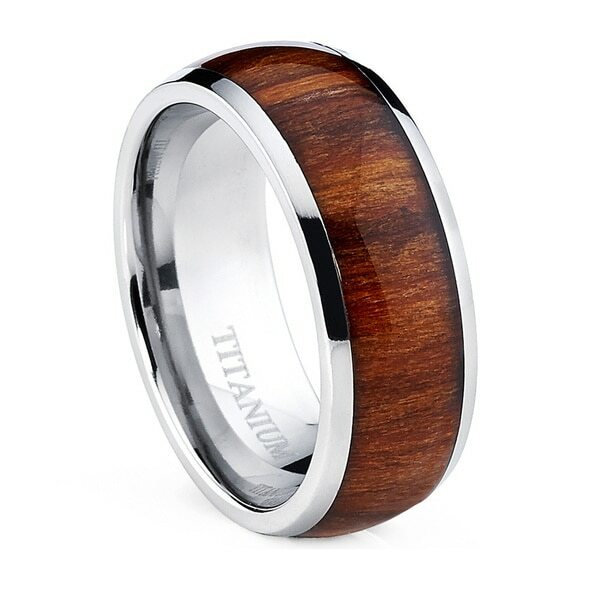 Oliveti Men's Dome Titanium Ring with Real Santos Rosewood Inlay, is a very nice ring. Fits comfortably and made very well. I've bought other rings like this and the quality of this one is far better. The ring is beautiful, my husband and I love the Santos Rosewood. What a nice handsome men's ring, especially if your man is a carpenter ! And how unusual that you can order it in half-sizes! The real Santos rosewood is gorgeous. Beautiful ring of good quality. My husband is a woodworker by hobby so I thought he'd appreciate the rosewood inlay and he does. The titanium is of course sturdy but lightweight so this became his everyday wedding band instead of the sometimes change I imagined it to be. The price is so low that I didn't think the quality would be this good but the ring has held up well even under some harsh conditions. This ring looks exactly like the picture. It has a high gloss finish that is very nice, but not very durable. I've only worn the ring a few times and you can already see some very minor blemishes in the clear coat finish. Nothing to worry about, but they're there with minimal use. Just an FYI in case you're going to wear this everyday. I'm used to wearing tungsten so I was surprised how light titanium is. Feels great on your finger and the rosewood looks really nice. Size wise, it fits exactly like a comfort fit band should. If you wear a comfort fit ring, order your normal size. Overall I would purchase again. Nice ring for a sweet price. A very unique ring. It has received lots of attention and is very fitting for someone who works with wood. My husband loves his wedding band. We had both been married previously and wanted something unique and non traditional. He is very impressed with the weight of the ring since it doesn't get in the way when he works. He builds all day and he's not a big jewelry wearer, he finds the ring very comfortable. We have received many compliments on the coloring of the wood. I can't complain, it is everything we wanted. It is a beautiful ring. LOVE this ring for my husband. I bought it 3 years ago for his wedding band. He owns his own business & pours concrete for a living & he refused to let me get him an expensive ring. We also liked the look of a wooden ring. This ring is still going strong 3 years later AND my husband never takes it off! I say an excellent investment for $36 bucks! Love the look of this ring! Bought for my husband and he wears it daily. It has a unique look to it and is very durable. So glad I purchased. It's really beautiful and my husband wears it every day. He says it is very comfortable. The only drawback is that it seems to scratch easily - he does computer work for a living so I'm surprised it would not hold up in that environment. I need to find out how to polish it and keep it looking nice. Would buy again and would definitely recommend to anyone looking for something classy and different. Fit was as expected. Has held up handsomely for two years. IT'S A WARM COLOR, COMFORTABLE, FITS WELL WITH NO SHARP EDGES.I WOULD RECCOMEND IT. Unique looking ring. The fit was a bit small so had to return it unfortunately but the quality was nice. The titanium around the edge makes it look like a proper piece of jewelry. Great fit. Very nice looking. Would recommend this ring. Oversized. Went to a jeweler prior to make sure I had the correct ring size and these seem to run big. Had to send back for exchange which I am currently waiting on. The return/exchange process seems to take longer than expected. This ring is absolutely beautiful. My husband loves it and says it fits comfortably. I would recommend this ring to anyone looking to purchase a men's band. Hubby was happy. Very nice. Easy to buy his size here. "Can I size the ring up to a13 1/4"
"Does this ring stand up to showering, every day use? How long does it last?" "I f this ring is too big, @12.5, is it sizable?" The ring is not resizable. no you cannot size the ring the wood wraps entire ring and would damage the wood. "I wear a womans size 7. What would a mans size equivalent be?" The best thing to do is go to a store that carries rings (like Kohls) and try them on. Then you can order what you need. Ring. Sizes are not gender specific. Same for men and women. The sizes are the same for men and women so there is no equivalent (or conversion) needed for sizing. To know what size to order for a man you would need to know his ring size. "Was there ever a 9 1/2?" I don't know. But you could eat less and buy a 9 or eat more and buy a 10. "Hi, I want a ring with 24mm internal diameter. I have to choose the 15 size? Thanks"
"Return or exchange policy in case I need different size?" Tips on Buying Women's Titanium Wedding Bands from Overstock.com. Our guides provide customers with tips on buying women's titanium wedding bands.